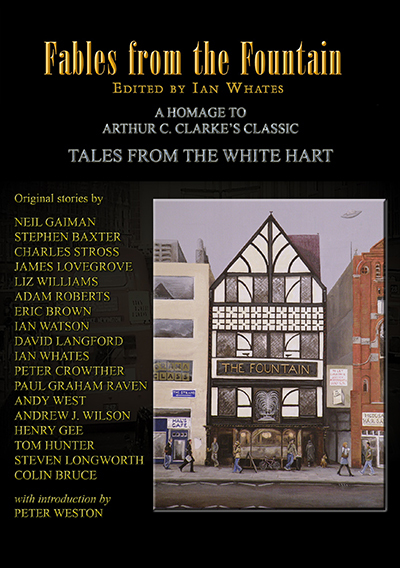 A volume written as homage to Arthur C. Clarke’s Tales from the White Hart, featuring original stories from many of today’s top genre writers, including Neil Gaiman, Charles Stross, Stephen Baxter, James Lovegrove, Liz Williams, Adam Roberts, Eric Brown, Ian Watson, and Peter Crowther. The Fountain: a traditional London pub situated in Holborn, just off Chancery Lane, where Michael, the landlord, serves excellent real ales and dodgy ploughman’s, ably assisted by barmaids Sally and Bogna. 2011 marked the 25th Anniversary of the Arthur C Clarke Award. This volume is produced in part to raise funds for the Award.